See backgrounder on clock operation and accompanying animation of NIST-F2. BOULDER, Colo.—The U.S. Department of Commerce's National Institute of Standards and Technology (NIST) has officially launched a new atomic clock, called NIST-F2, to serve as a new U.S. civilian time and frequency standard, along with the current NIST-F1 standard. 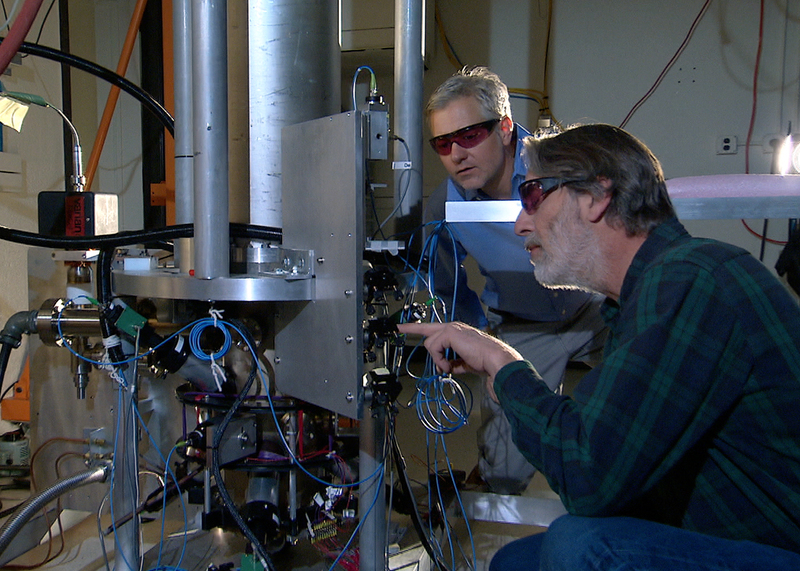 NIST physicists Steve Jefferts (foreground) and Tom Heavner with the NIST-F2 cesium fountain atomic clock, a new civilian time standard for the United States. NIST-F2 would neither gain nor lose one second in about 300 million years, making it about three times as accurate as NIST-F1, which has served as the standard since 1999. Both clocks use a "fountain" of cesium atoms to determine the exact length of a second. NIST-F2 is the latest in a series of cesium-based atomic clocks developed by NIST since the 1950s. In its role as the U.S. measurement authority, NIST strives to advance atomic timekeeping, which is part of the basic infrastructure of modern society. Many everyday technologies, such as cellular telephones, Global Positioning System (GPS) satellite receivers, and the electric power grid, rely on the high accuracy of atomic clocks. Historically, improved timekeeping has consistently led to technology improvements and innovation. NIST has officially launched NIST-F2. NIST-F2, a new atomic clock based on a "fountain" of cesium atoms, is now the U.S. civilian time standard. NIST-F2 will neither gain nor lose one second in 300 million years, making it more than twice as accurate as its predecessor, NIST-F1, which was the U.S. civilian time and frequency standard since 1999. "If we've learned anything in the last 60 years of building atomic clocks, we've learned that every time we build a better clock, somebody comes up with a use for it that you couldn't have foreseen," says NIST physicist Steven Jefferts, lead designer of NIST-F2. For now, NIST plans to simultaneously operate both NIST-F1 and NIST-F2. Long-term comparisons of the two clocks will help NIST scientists continue to improve both clocks as they serve as U.S. standards for civilian time. The U.S. Naval Observatory maintains military time standards. Both NIST-F1 and NIST-F2 measure the frequency of a particular transition in the cesium atom—which is 9,192,631,770 vibrations per second, and is used to define the second, the international (SI) unit of time. The key operational difference is that F1 operates near room temperature (about 27 ºC or 80 ºF) whereas the atoms in F2 are shielded within a much colder environment (at minus 193 ºC, or minus 316 ºF). This cooling dramatically lowers the background radiation and thus reduces some of the very small measurement errors that must be corrected in NIST-F1. Video of The NIST-F2 Atomic Clock: How does it work? NIST-F2 was designed using lessons learned from NIST-F1. The key advance is that the vertical flight tube is now chilled inside a container of liquid nitrogen, at minus 193 ºC, or minus 316 ºF. This cycled cooling dramatically lowers the background radiation and thus reduces some of the very small measurement errors that must be corrected in NIST-F1. NIST-F2 also has other novel features. Some critical components shrink by 1 centimeter in length each time the clock is cycled to very cold temperatures, so the clock design allows for shrinking and expanding. In addition, the system of six laser beams used to cool the cesium atoms is arranged in a new way. Additional design enhancements to NIST-F2 are planned for the future. NIST provides a broad range of timing and synchronization measurement services to meet a wide variety of customer needs. NIST official time is used to time-stamp hundreds of billions of dollars in U.S. financial transactions each working day, for example. NIST time is also disseminated to industry and the public through the Internet Time Service, which as of early 2014 received about 8 billion automated requests per day to synchronize clocks in computers and network devices; and NIST radio broadcasts, which update an estimated 50 million watches and other clocks daily. At the request of the Italian standards organization, NIST fabricated many duplicate components for a second version of NIST-F2, known as IT-CsF2 to be operated by Istituto Nazionale di Ricerca Metrologica (INRIM), NIST's counterpart in Turin, Italy. Two co-authors from Italy contributed to the new report on NIST-F2. The cesium clock era officially dates back to 1967, when the second was defined based on vibrations of the cesium atom. Cesium clocks have improved substantially since that time and are likely to improve a bit more. But clocks that operate at microwave frequencies such as those based on cesium or other atoms are likely approaching their ultimate performance limits because of the relatively low frequencies of microwaves. In the future, better performance will likely be achieved with clocks based on atoms that switch energy levels at much higher frequencies in or near the visible part of the electromagnetic spectrum. These optical atomic clocks divide time into smaller units and could lead to time standards more than 100 times more accurate than today's cesium standards. Higher frequency is one of a variety of factors that enables improved precision and accuracy. For the media: High-definition video b-roll available on request. *T.P. Heavner, E.A. Donley, F. Levi, G. Costanzo, T.E. Parker, J.H. Shirley, N. Ashby, S.E. Barlow and S.R. Jefferts. First Accuracy Evaluation of NIST-F2. 2014. Metrologia 51 174 doi:10.1088/0026-1394/51/3/174. **These data are reported monthly in BIPM's Circular T, available online at http://www.bipm.org/jsp/en/TimeFtp.jsp?TypePub=publication#nohref. NIST-F2 is scheduled to be listed for the first time in the March 2014 edition. The value of interest is Type B (systematic) uncertainty.